A Special Economic Zone (SEZ) is a geographical region that has economic laws that are more liberal than a country’s typical economic laws. The category ‘SEZ’ covers a broad range of more specific zone types, including Free Trade Zones (FTZ), Export Processing Zones (EPZ), Free Zones (FZ), Industrial Estates (IE), Free Ports, Urban Enterprise Zones and others. Usually, the goal of an SEZ structure is to increase foreign investment. HSN Realty Services is the most prominent Commercial Real Estate Agency, Property Advisors for sourcing Commercial Space for rent, best property in SEZ of Haryana, Uttar Pradesh, Madhya Pradesh, Punjab, Chandigarh (India). 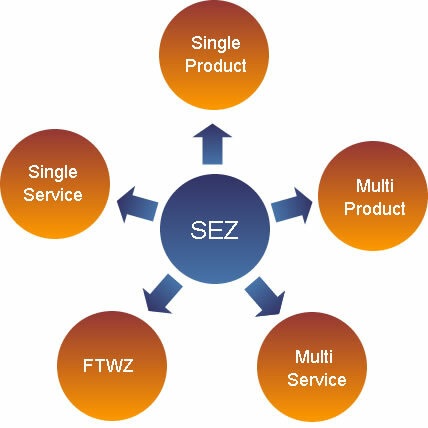 SEZs are Industrial Townships outside the customs duty territory of India. SEZs are synonymous with globalization and meant to ensure a flow of labour and capital from surplus to deficit regions so that everyone benefits from investment and export promotion. The lower cost of production an SEZ makes exporting from India attractive while offering the unique advantage of servicing a potentially large Indian market at the same time. Name of SEZ: Dr Fresh Healthcare Pvt. Ltd.
Name of SEZ: DLF Ltd.
Name of SEZ: DLF Cyber City Developers Ltd.
Name of SEZ: Gurgaon Infospace Ltd.
Name of SEZ: Unitech Realty Projects Ltd.
Name of SEZ: Quarkcity India Pvt. Ltd.
Name of SEZ: Ranbaxy Laboratories Ltd.
Name of SEZ: Mahindra World City (Jaipur) Ltd.
Name of SEZ: Moser Bear India Ltd.
Name of SEZ: HCL Technologies Ltd.
Name of SEZ: Infosys Ltd.